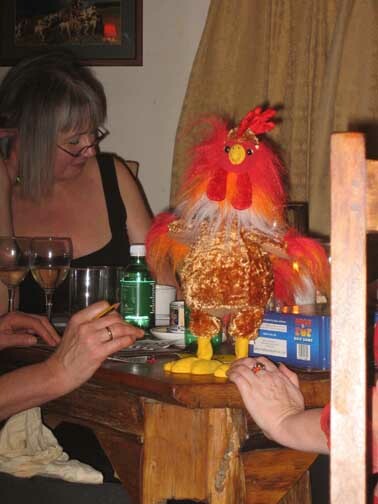 Date & Time: Monday 1st January, New Year's Day 2007. Midday start. 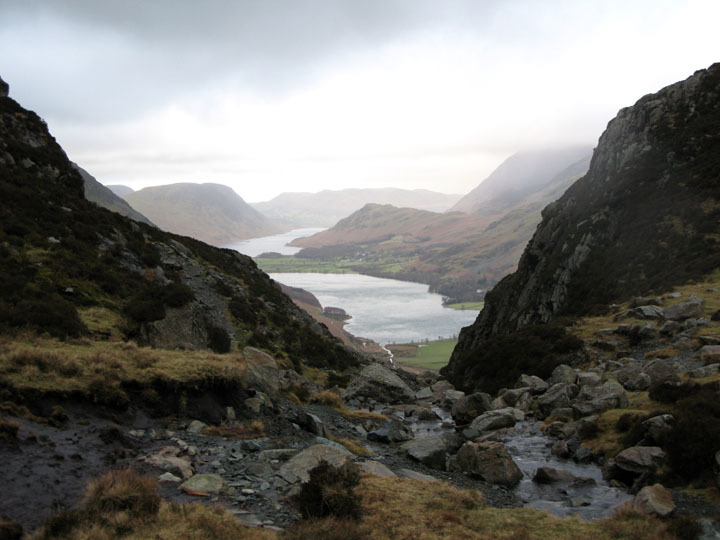 Places visited : Peggy's Bridge, Scarth Gap, Haystacks, Blackbeck Tarn, the other Dubbs Bothy, and back via the Miners track down to Warnscale Bottom and Gatesgarth. 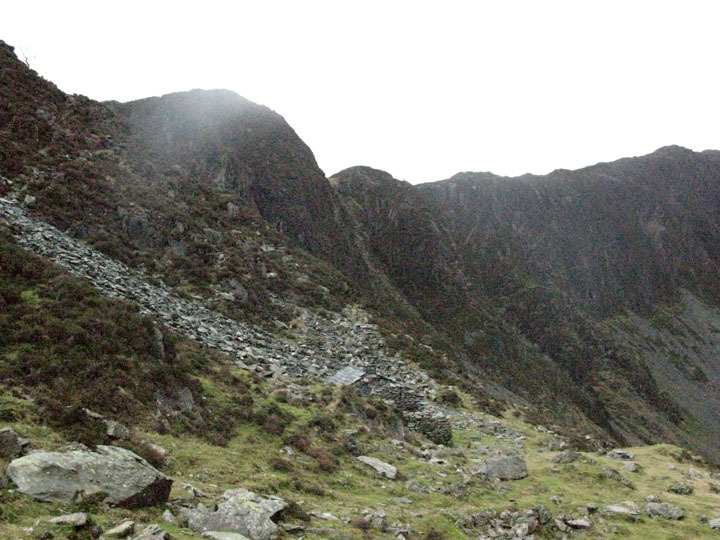 Walk details : 4.5 mls, 1750 ft of ascent , 4 hrs 15 mins. 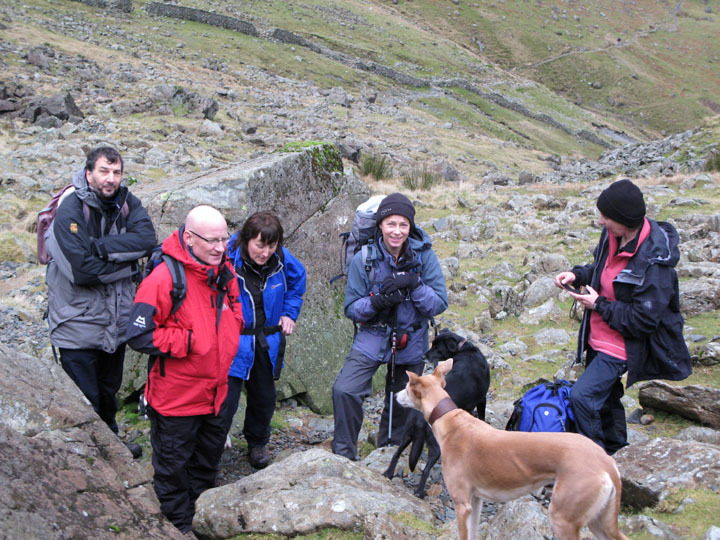 Walked with : Jill and David, Jo, John, Hilton, Hannah and Paul, Ann and all six dogs. Harry, Bethan, Polly, Jodie, Megan and the Dalmatian Suzy. Weather : A wintery day without the '"wonderland " bit they sang about over Christmas. Before we went on our walk on New Year's Day, there was the little matter of the night before . . .
For the benefit of friends, the cockerel, and as a thank you to the Kirkstile Inn, here are just a few photos to celebrate the evening. 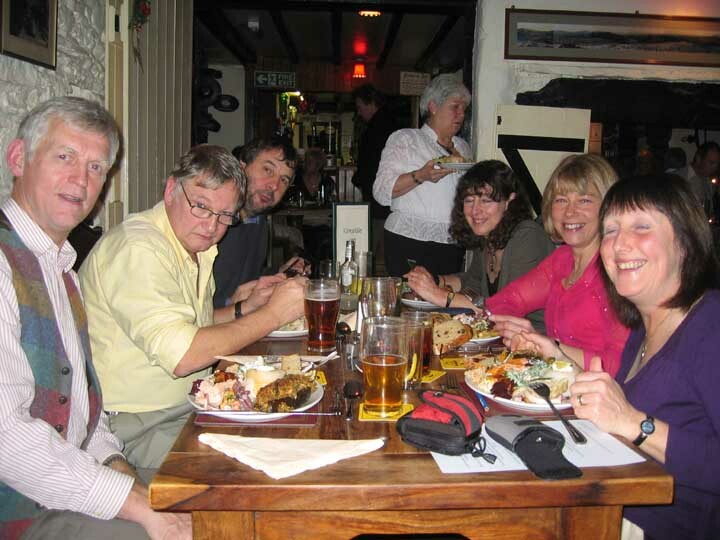 A table of friends, six ninths of the following days walkers. 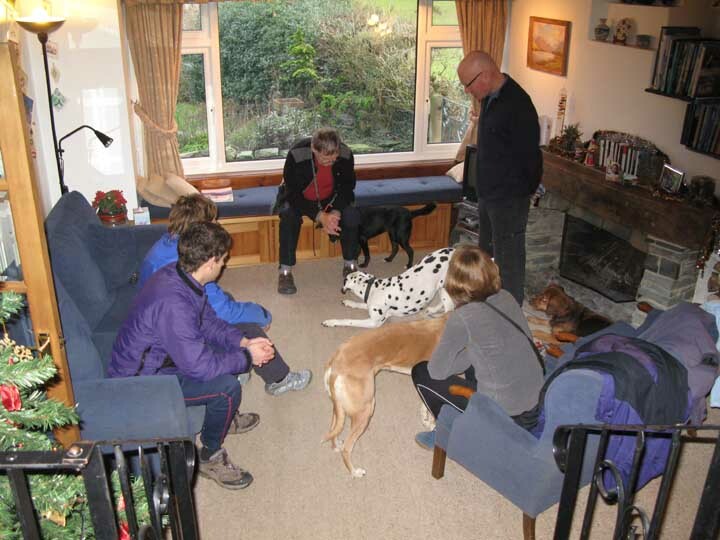 Next day we gathered all the other dogs together ready for the walk. A room full already and ours were not yet on the scene. 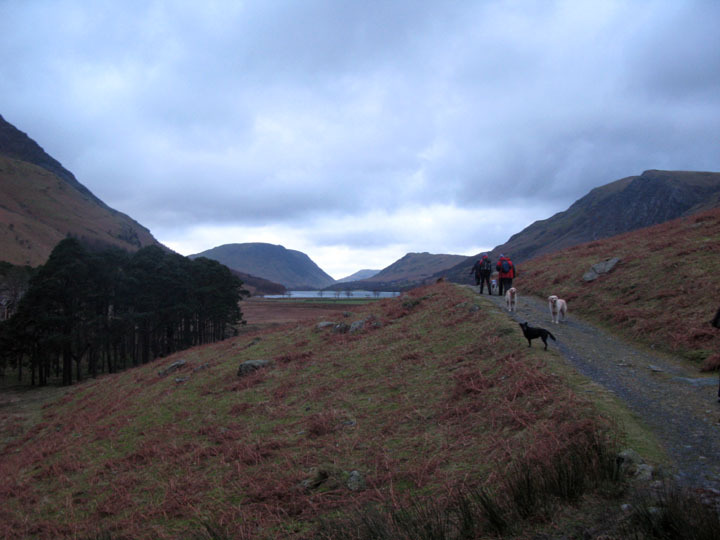 We're on our way now, up the valley past the Buttermere Pines, at midday on New Year's Day. 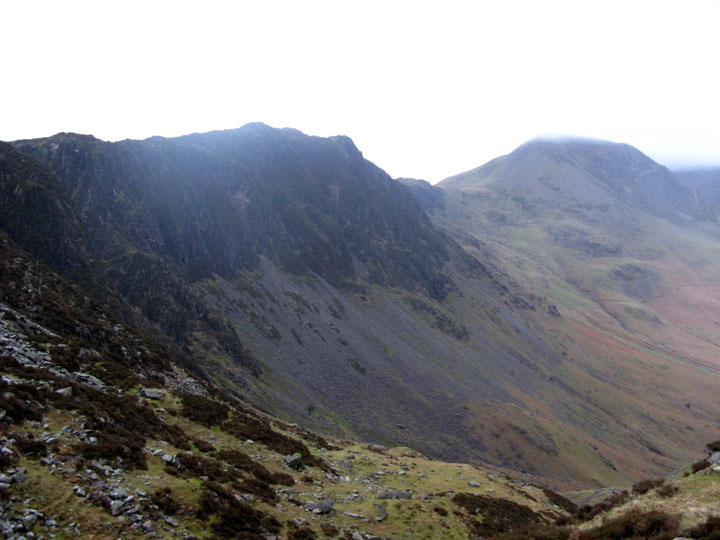 The route would follow the skyline from Scarth Gap (centre right) over Haystacks, round to Dubbs and back via Warnscale Bottom. 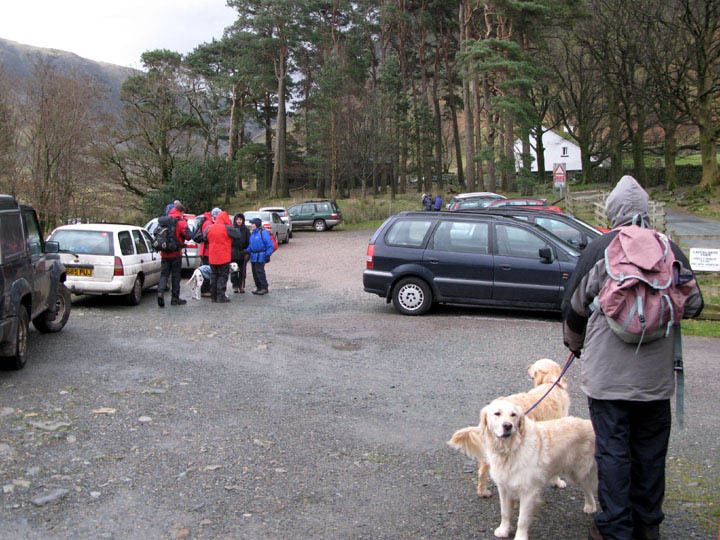 We left the cars at Gatesgarth. Crossing to Peggy's Bridge we passed the lakeside bothy. This must be the first time I have seen the place being used. There's smoke coming out of the chimney ~ good to see. From the bridge the path climbs as it skirts the wood. 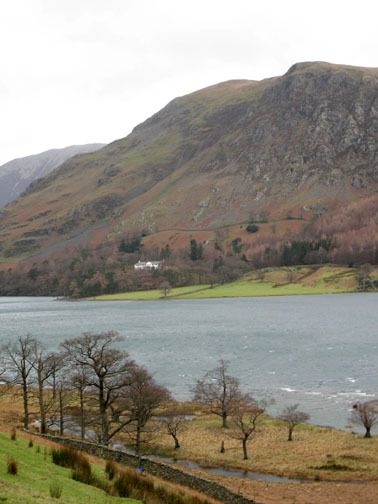 Hassness House on the opposite shore of Buttermere. 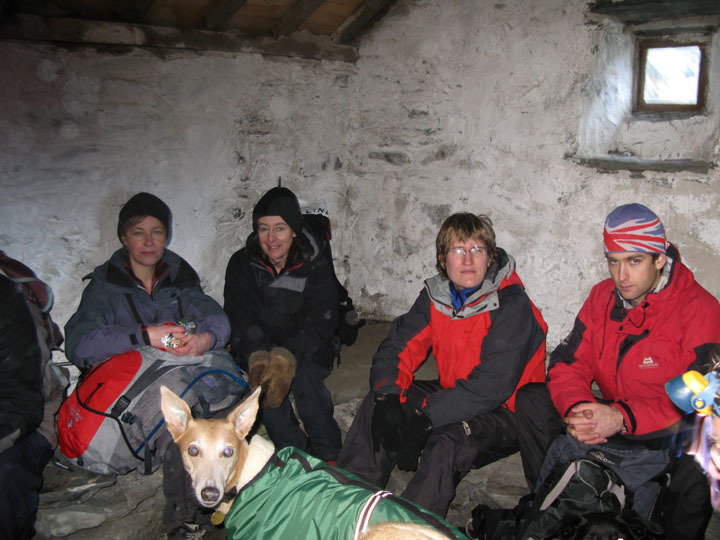 A brief stop to catch our breath as we have been climbing, working off last night's excellent supper. David, Hilton, Ann, Jo (Jodie and Megan) and Jill. It's been a while since it was used for it's original purpose. 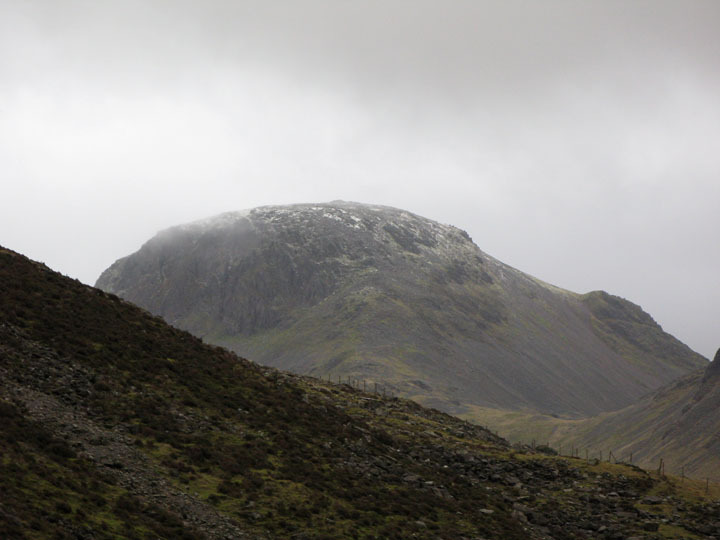 From the same place, this time a close up of a wintery Great Gable and Beck Head. 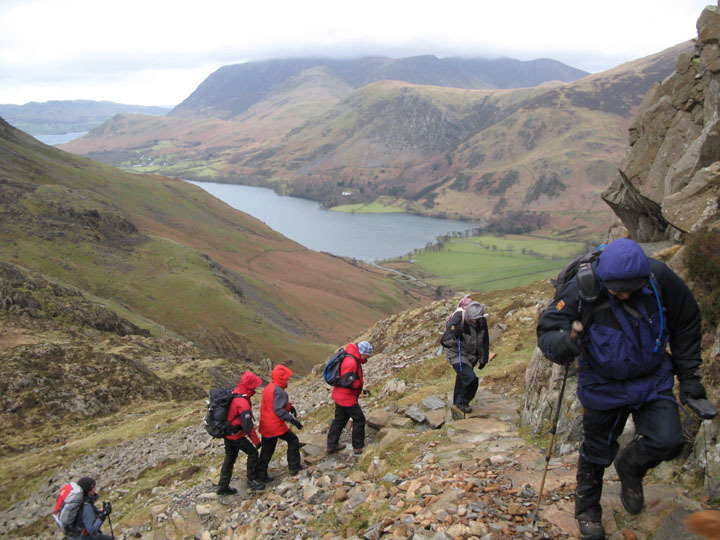 Following the pitched path up Haystacks makes navigation easy. Grasmoor and the North Western Fells are just touching the cloud. 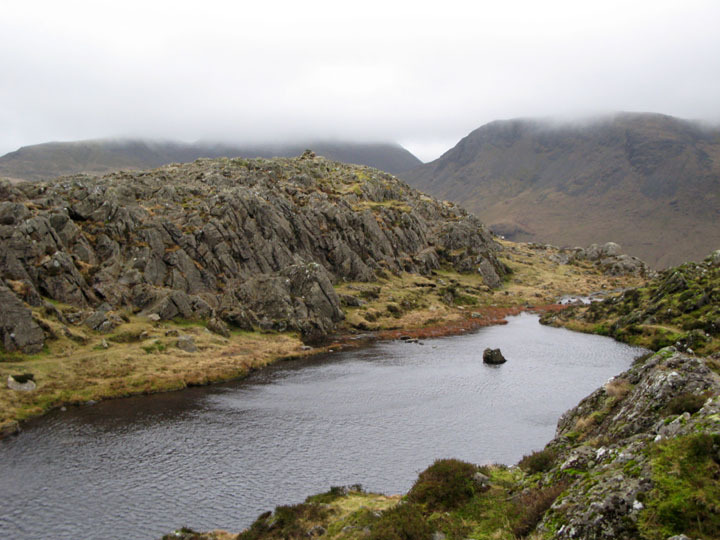 Gable and Kirk Fell, pictured over Haystacks's summit cairn, are now missing their tops. 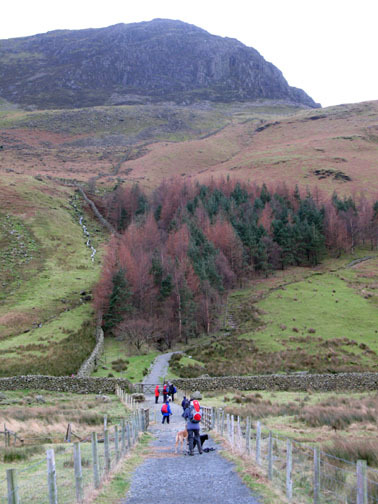 The highest point of the walk . 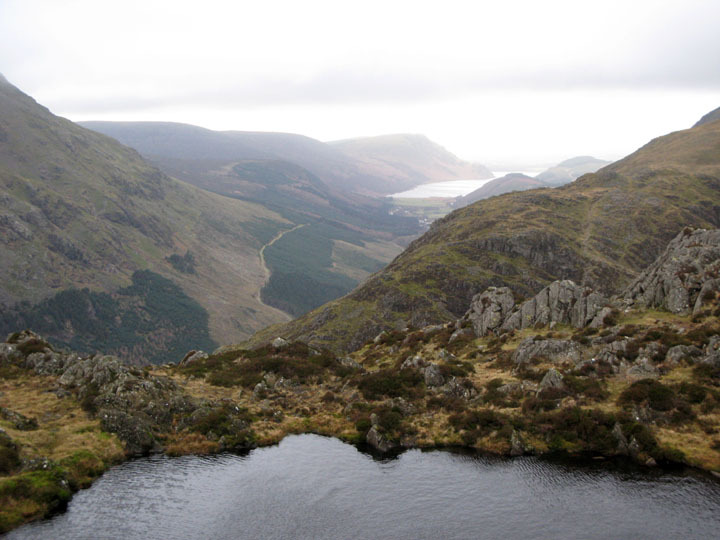 . .
Ennerdale Valley and the lake from the top of Haystacks. 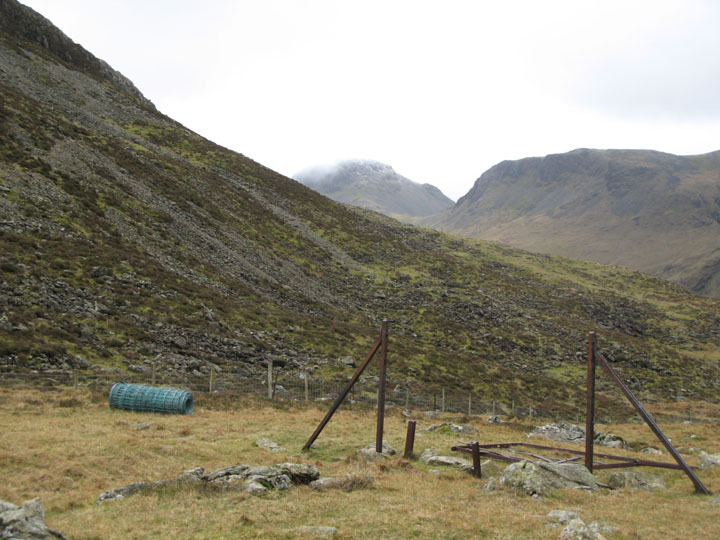 The troops seem to be gathering at the other cairn ~ do they think they've reached the top already ? I'm photographing them from above. 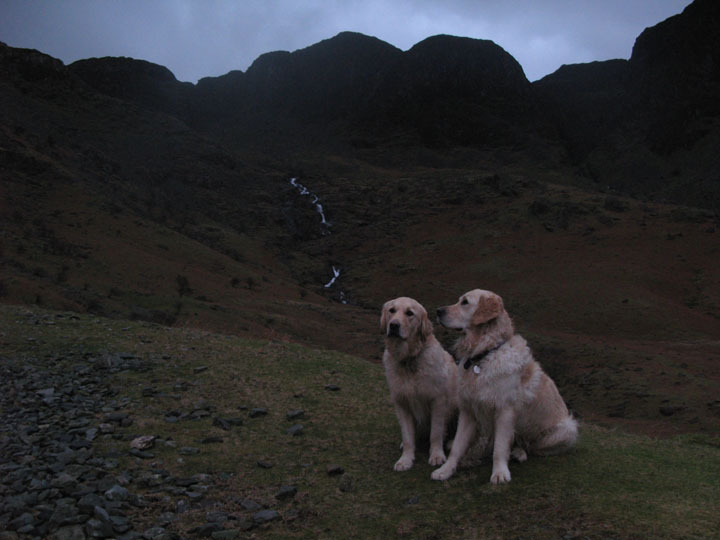 Could that be a clue that they still have a little climbing yet to do ! 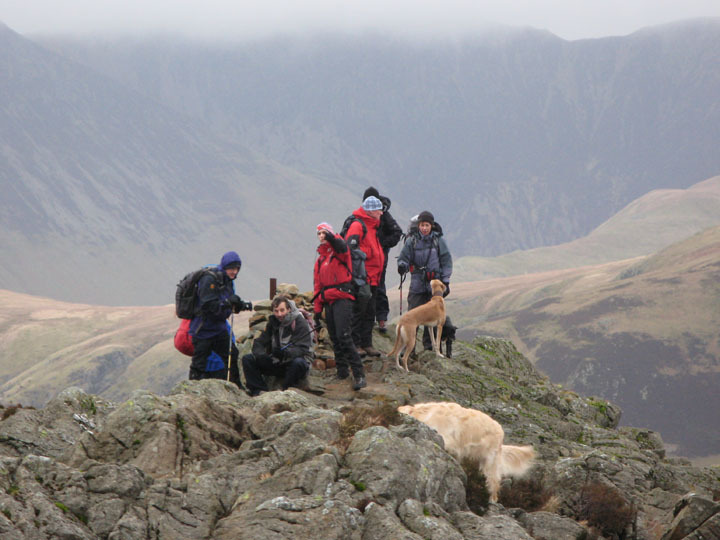 All sorted on the true summit, the next objective is Innominate Tarn across the high ground of Haystacks. 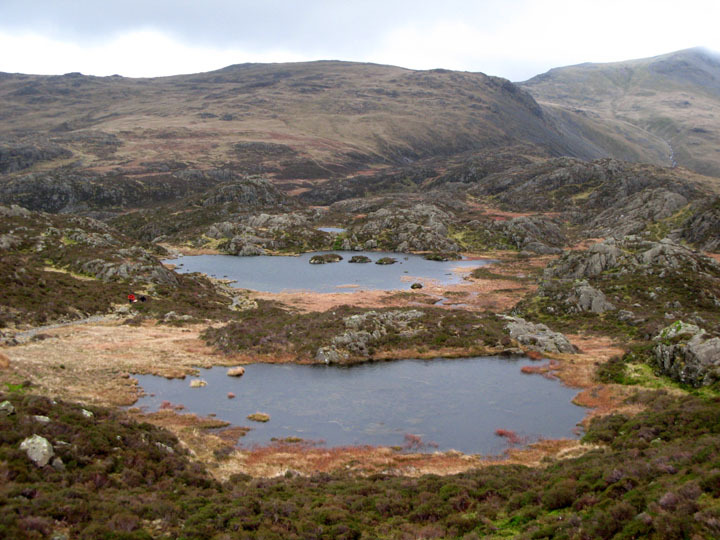 looking unusually small due to the closeness of the other nameless tarn higher up on the fell side. Green Gable is clear now, and Windy Gap was living up to it's name as the cloud raced through between it and Great Gable. 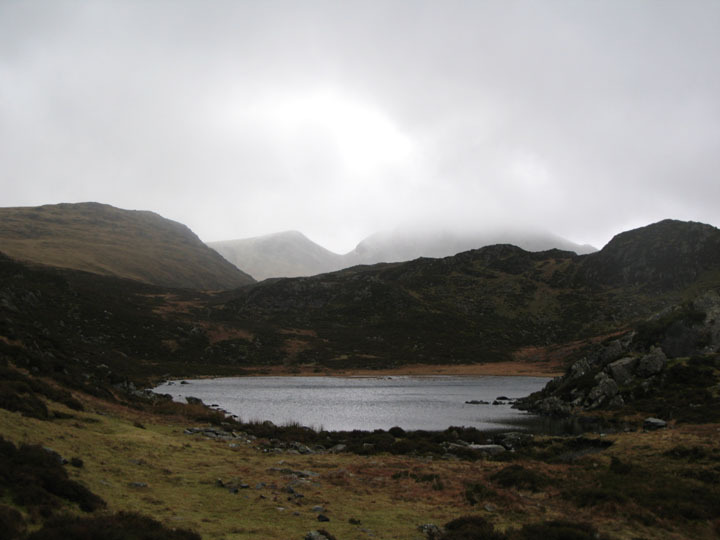 Click here or on the photo for a larger panorama of the tarn. 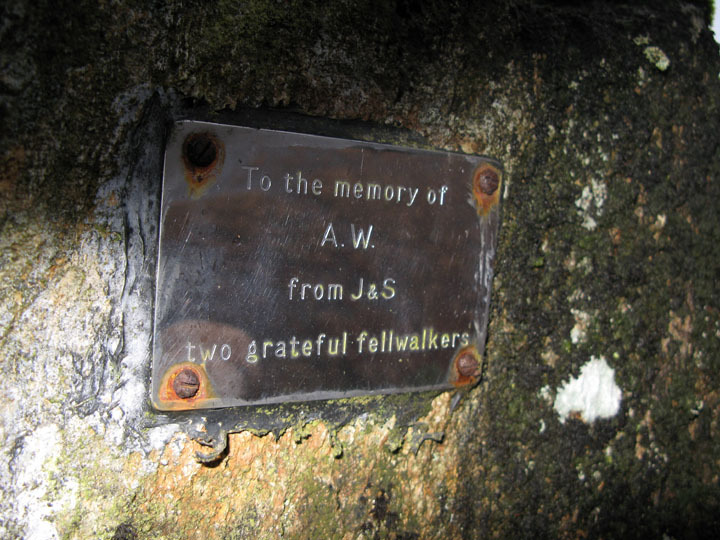 On the far side of the tarn there is a small, discreet plaque as befits this final resting place of Alfred Wainwright. 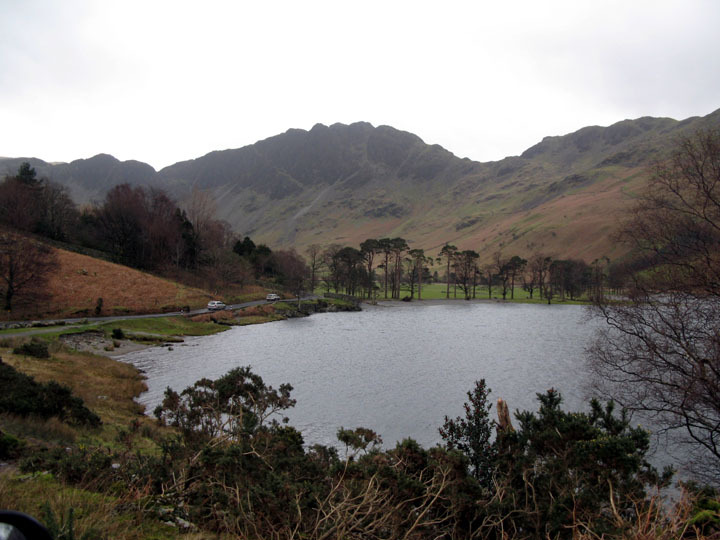 His ashes were scattered here in 1991, and the the hundredth anniversary of his birth is to be formally celebrated this month by the Wainwright Society in his home town of Blackburn. 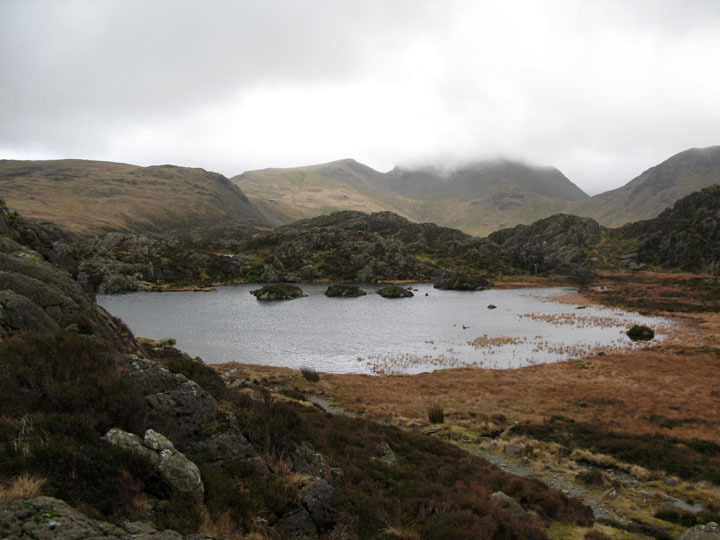 Blackbeck Tarn as a wintery shower crosses from the high fells and starts to engulf us ! 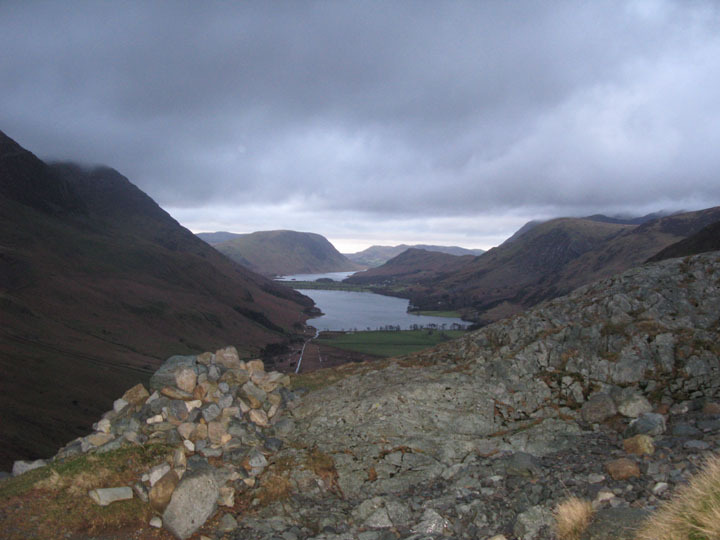 Short and sharp, but soon clear so we get a good view down over Buttermere and Crummock Water. 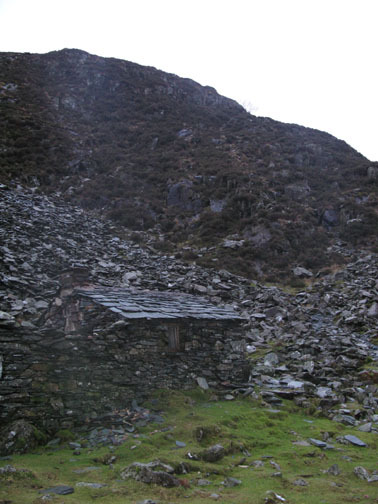 Lunch is a little overdue as a result of the weather so we are looking for the other quarryman's bothy below Dubbs. 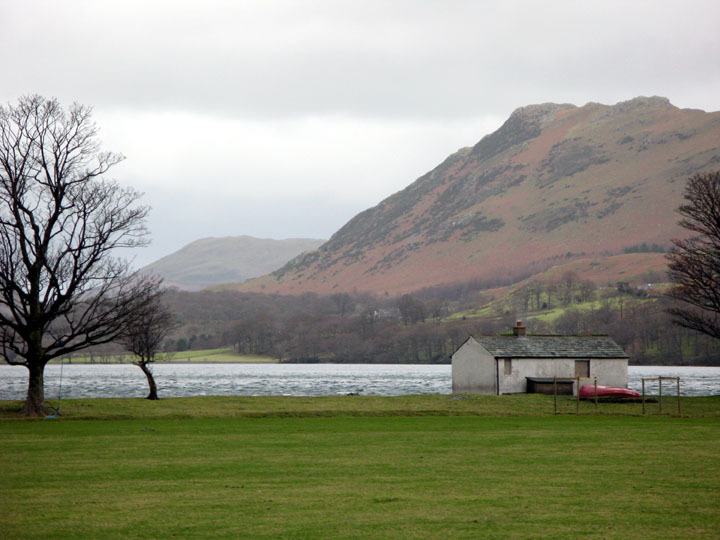 Blending in, almost hidden amongst the fell side, we spot the small slate roofed building. A small door leads to a dry, if rather dark single room. A single candle was lit as we get used to the darkness. 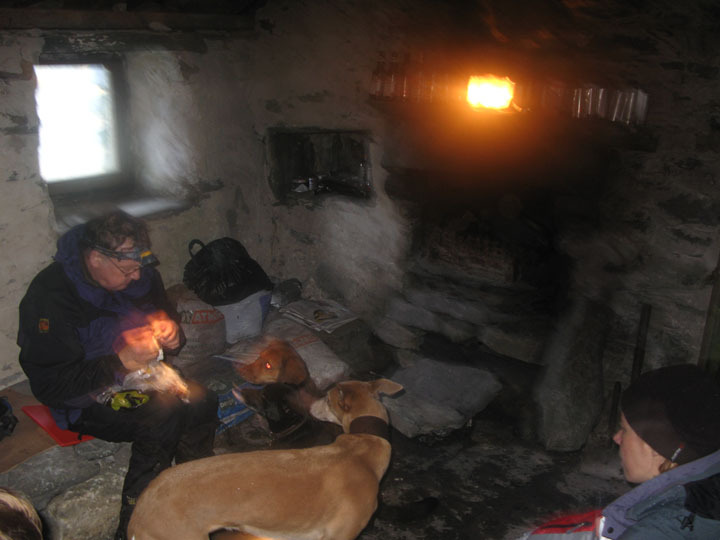 John finds a little lunch by the light of his head torch. I think the dogs have found his lunch too, using the same illumination ! Getting used to the light after our slightly extended stop for lunch. Jo, Jill, Hnnah and Paul with Jodie in front. 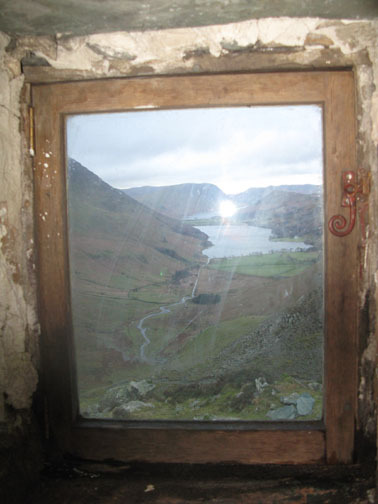 The view from the window, our route back down to Gatesgarth. 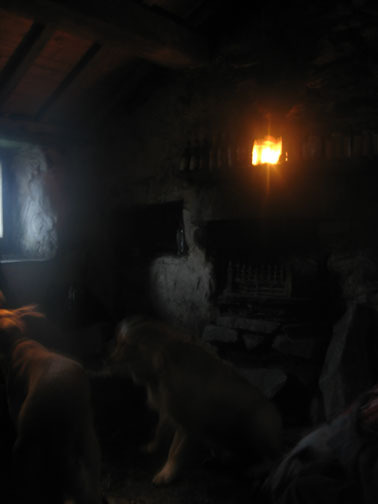 We leave the little bothy ready for the next visitors. 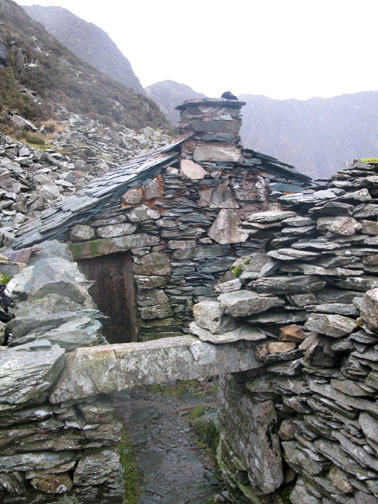 These small mountain bothies are organised and maintained by the Mountain Bothy Association.
" I am pleased to report that there is now a complete roof on Warnscale Head thanks to Denis and his 9 strong team. Good weather helped the job along. " 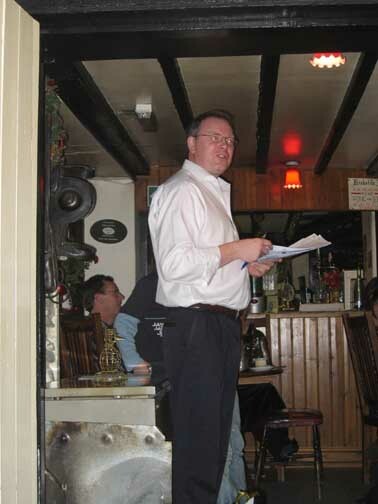 Many thanks to Mr I Silver who emailed me recently. 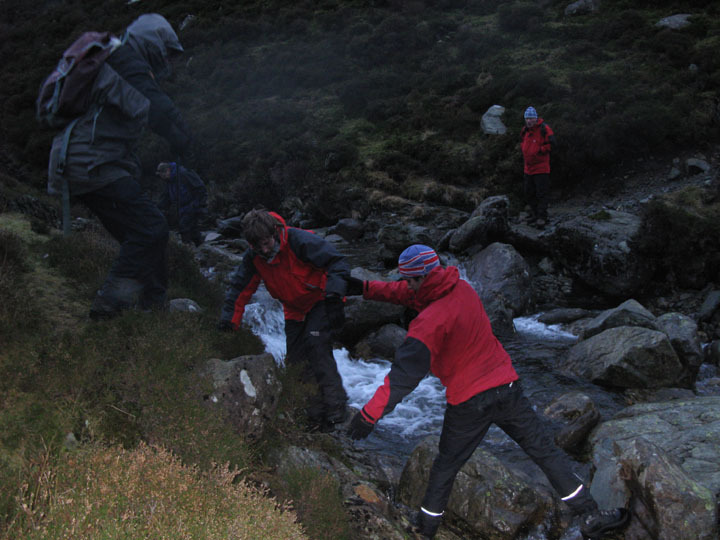 The paths and rocks today have been particularly slippery, especially these by the beck, as we cross to the main path. as the flash illuminates the foreground of this view down the valley. 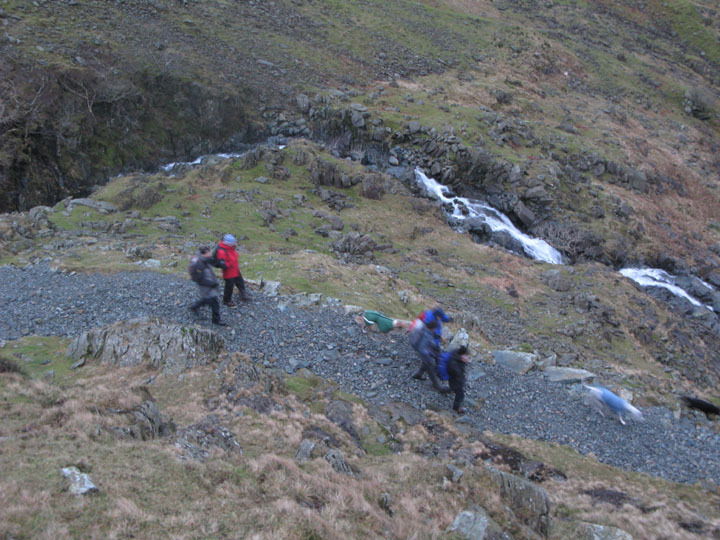 A slow shutter speed catches the walkers movements on the bend of the old miner's path. Patiently waiting near the bottom for the last of the party, or were they waiting for a last treat ? 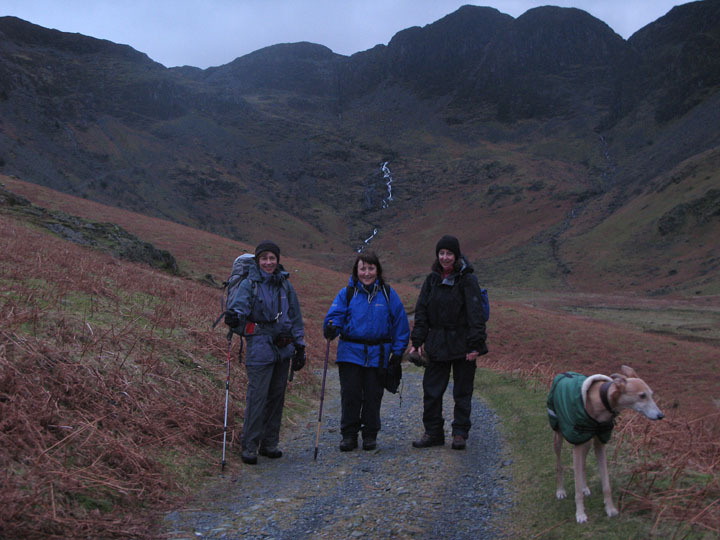 Jo, Ann and Jill, walking the track out of the valley. Nearly back to the car. The poorer weather has held off and we were home and dry. Technical note: Pictures taken with a Canon G7 Digital camera. This site best viewed with . . . Christmas cake to share.